Management Policy and Plan | NAGASE at a Glance | Investor Relations | NAGASE & CO., LTD.
NAGASE Group has formulated the Long-term management policy aimed at moving us toward our 200th anniversary in 2032. It provides directions that we can not accomplish through our current activities. We are taking action together to bring change to NAGASE under the Long-term management policy. 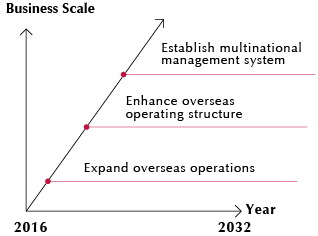 Realize a significant growth by allocation resources to focus field, and by shifting operation from Japan-centrism to multinational management system. Research business investment as a means for growth, including large-scale investments. Lead our challenges for growth to success, with forming the basis of scale expansion and globalization. NAGASE Transforms from "Shosha/Trading" to "Business Designer"
Nagase strings all the groups together to create and provide new value to the world through 6 key functions. Leverage Group functions to achieve the quantitative and qualitative targets. Expand and Strengthen Revenue Base Accelerate globalization "G6000"
Divide into 4 sectors, "Growth", "Focus", "Base" and "Improvement" to gain maximum efficiency of management resources and expand business. Accelerate to withdraw from unprofitable business, solidify management resource that can be reallocated, conduct aggressive growth investment. Categorize profitable and unprofitable business by using NPV(Net Present Value) and comparing hurdle rate/IRR to accelerate asset replacement. Proactively execute own market strategy in each area. Elevate group presence by increase in sales. Search and execute growth investment(M&A) that matches with the market strategy of the designated area accelerate the business development to expand business (especially focused in North America). New market development via strengthened 'out-out' organic ties. As a long term strategy, group manufacturing companies message autonomously, and create a new business based on a scenario agreed upon by manufacturing, development and sales. New product development and placement of the product into market, cultivation of new market and penetrate into high value added filed. e.g. Overseas sales expansion of Trehalose, capital investment of epoxy sheet material, R&D on conductive material for coating and etc. It is different from the figures disclosed on the consolidated financial statement. Set mid-term management plan as a goal that proactively achieves and act responsible. Create better communication infrastructure and the entire group collectively strives for the same goal. Make full use of dashboard and through monitoring to carry out PDCA cycle to achieve KGI/KPI.